"Exploring the past with the aim of bringing it to 'life' implies that we should see, feel, hear, smell and taste the past so that we can ultimately 'experience' life as it was led by our forebears." B. Goodacre & G. Baldwin (2002) Living the Past, p.10. 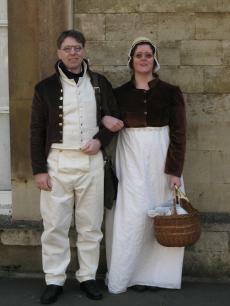 A Living History activity and display for Museum and Heritage sites and for events that celebrate aspects of Victorian life. Maureen James has been building on the years of research for her PhD, on the folklore of Lincolnshire and the Fens, by setting up a Victorian Living History display and demonstration. This activity received a favourable reception in the Heritage area at the 2012 Heckington Show and then at Gloucester Through the Ages and at Sherwood Forest through the Ages. Maureen provides artefacts, images and text to illustrate folk beliefs and the annual folk calendar. These, when accompanied by age related commentary, have been shown to successfully provoke reminiscences from the more senior members of the audience and interested comments from the younger. Maureen portrays a fictional late Victorian folklorist (named Wilhelmina Peacock) and is often accompanied by her husband Stuart (as her cousin Adrian Fowler). 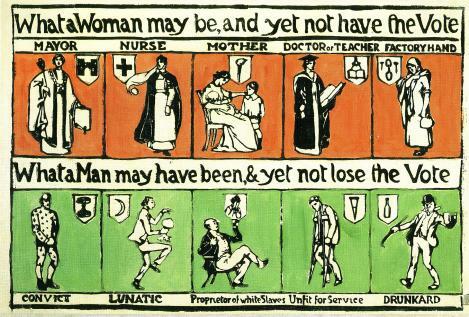 A new Living History Activity which illustrates the struggle of women to obtain the right to vote during the wider Edwardian period from 1901 – 1919. The term 'suffragette' was initially used as a term of derision to refer to activists in the British women's movement, particularly members of the Women's Social and Political Union (WSPU). This organisation, which was founded in 1903 by Emmeline Pankhurst, adopted militant tactics, which included chaining themselves to railings, smashing windows and even detonating bombs. One active suffragette, Emily Davison, died at the Epsom Derby on 5 June 1913 whilst trying to throw a 'Votes for Women' banner over the King's Horse. Other suffragettes are remembered for their being force-fed during a hunger strike whilst in Holloway Prison. When Britain became involved in the First World War, Emmeline Pankhurst instructed the WSPU to suspend their militant actions and support in every way, the war effort. For the work done by women during the war, Parliament passed the Representation of the People Act in 1918. Maureen portrays a fictional suffragette at a time shortly after the outbreak of the First World War. As such, she does not chain herself to railings or jump under a horse as part of this presentation, but rather shows some artefacts and posters and tells the stories of the people whose lives and actions illustrate the aims of the campaign. The second of the new Living History presentations, in this activity Maureen James will draw on her wealth of knowledge about the campaign to abolish Slavery throughout the British Empire. A revival of an old friend...this Living History presentation involves Goody Burder who tells tales and describes events from the seventeenth century. 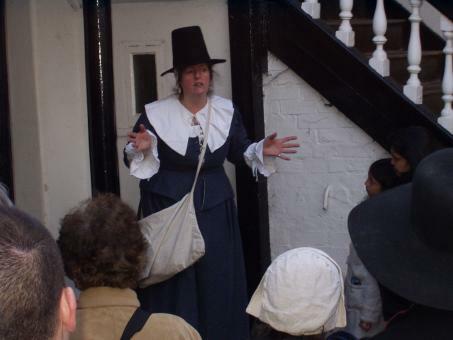 Goody Burder is a character that Maureen James has used a number of times in Huntingdon for the Cromwell Museum, leading storywalks around the town. Now, drawing on her folklore research, Maureen will extend the presentation to not just comment on seventeenth century events but also focus specifically on the fear of witchcraft and the reason why so many old women where suspected of such practices. This presentation will also include a display of a number of relevant artefacts. Each of these displays can either be installed within your premises (for which a long table is required) or we can provide the Telling History cover (for which an area of 7 metres square is required for the structure including guys).